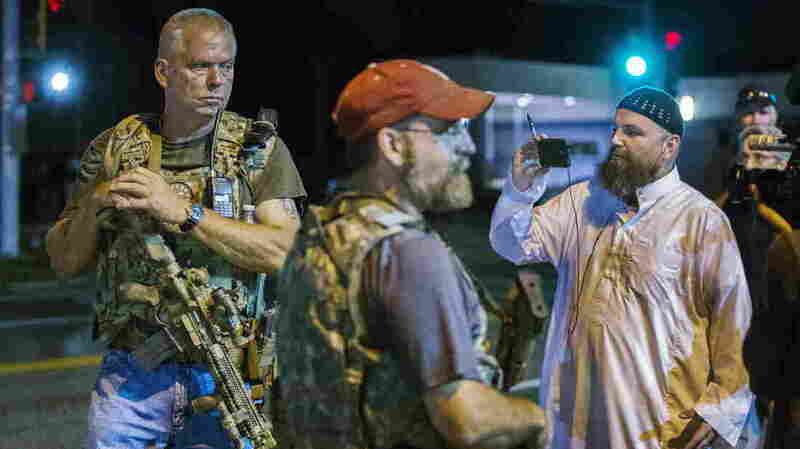 More Than 20 Arrested In Ferguson; Armed 'Oath Keepers' Walk Streets : The Two-Way No new violence was reported in Ferguson, Mo., but dozens of people were arrested Monday. Late into the night, men armed with assault rifles walked the streets. 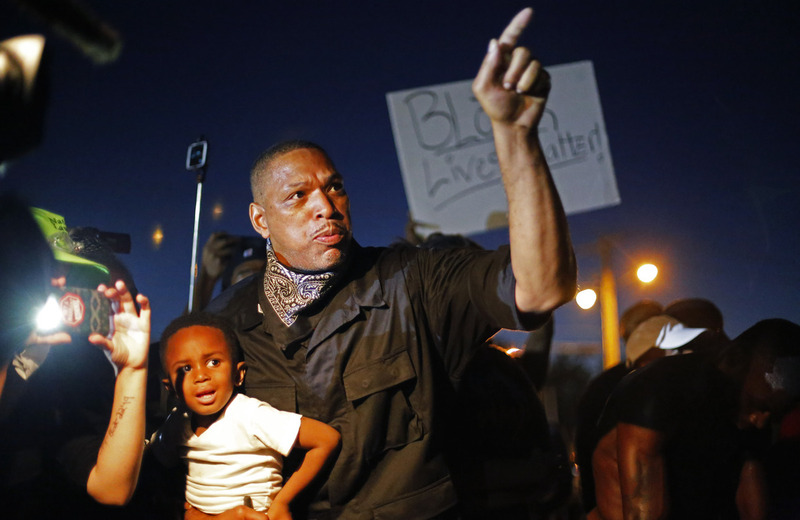 The night also brought a new development to Ferguson: Sometime after midnight, "a group of five white men who call themselves the Oath Keepers arrived on the scene," St. Louis Public Radio reports. "They carried assault weapons, which raised alarm from protesters." The Oath Keepers members said they had come to help keep the peace. The group says its core membership is made up of veterans and active-duty members of the military and first responders, such as police and firefighters. The new round of demonstrations center on Sunday's anniversary of the killing of Brown, an 18-year-old black Ferguson resident who was unarmed when he was shot by (now former) police officer Darren Wilson, who is white. U.S. Attorney Richard Callahan said that nearly 60 protesters were arrested Monday "for obstructing the normal use of the entrances" to the federal courthouse in St. Louis. A previous version of this post misidentified Richard Callahan, U.S. attorney for the Eastern District of Missouri, as U.S. attorney general.